There is presently a mismatch between the importance of processor in determining the performance of a Smartphone and the significance users attach to it. techARC recently announced the first edition of DIGIT (Digital India Granular Insights and Trends), a user insights programme for deep insights about digital users in India. The first techARC DIGIT edition was focussed on Smartphone users in India. “There is a need to educate users more about the role of a processor in defining not only the capabilities but the performance of a Smartphone as well,” Faisal added. The research further emphasised that the entire Smartphone value chain, specifically OEMs should utilise more capabilities of processors that the present day Smartphones are already equipped with. This will take the performance and capabilities of these phones to the next levels. These Smartphones are ‘Superphones’ in terms of processor capabilities and OEMs must utilise it effectively to give users the level of experience they deserve. It’s time for OEMs to start unlocking various advanced features of a processor that will add intelligence to these smartphones. So far, the capabilities like AI has more been applied on camera and power management. However, its time to explore stronger use cases of AI and other advanced computing capabilities of processors. The report identifies RAM as the deciding parameter followed by the capacity of the battery. 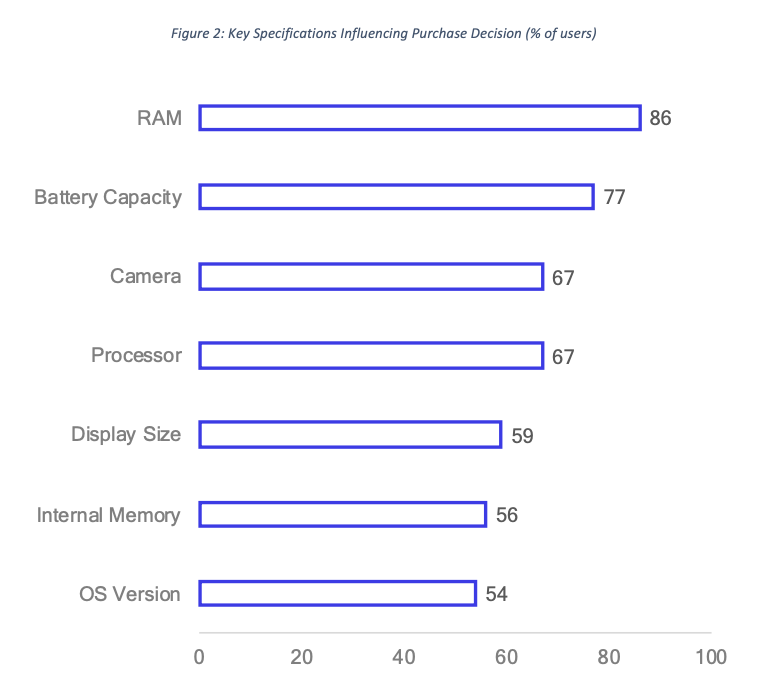 Camera and Processor stood 3rd in terms of the key specifications that users decide on. With heavy dependence on RAM alone, users will hit performance bar and will not get the perceived experience out of Smartphone purchases. They will have to understand the role of processors as well. Performance has taken precedence over pricing and users are ready to pay for better performance. User education about the role of the processor is still limited. The entire ecosystem needs to work on increasing awareness of processors and the role they play in a Smartphone. 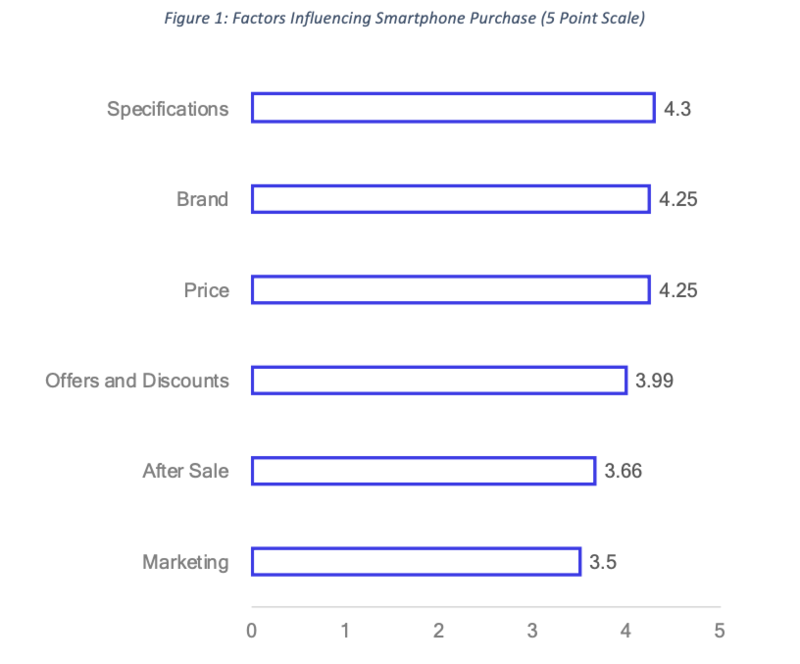 Value enhancing specifications like Fast Charging, AI in Cameras, etc., also have an impact on the decision making process of Smartphone buyers. All these have a direct dependence on the power of processor being used. People prefer reliable sources of information to educate before making a purchase decision. These include friends, who can also share experience, and online sources like websites, blogs and other information sources. The objective of this research was to travel through the journey of a Smartphone user from intent to experience stages and decipher the key insights and trends. 1,000 Smartphone users were interacted, and their views and opinions were captured digitally. The users were based across India cutting through their socio-demographic profiles.